A couple of weeks back I shared my first empties post in a long, long time, having let my empties box build up into a monster of empty products. Today I'm back with another empties post; short and sweet reviews of the latest skincare and body care products I've finished up! 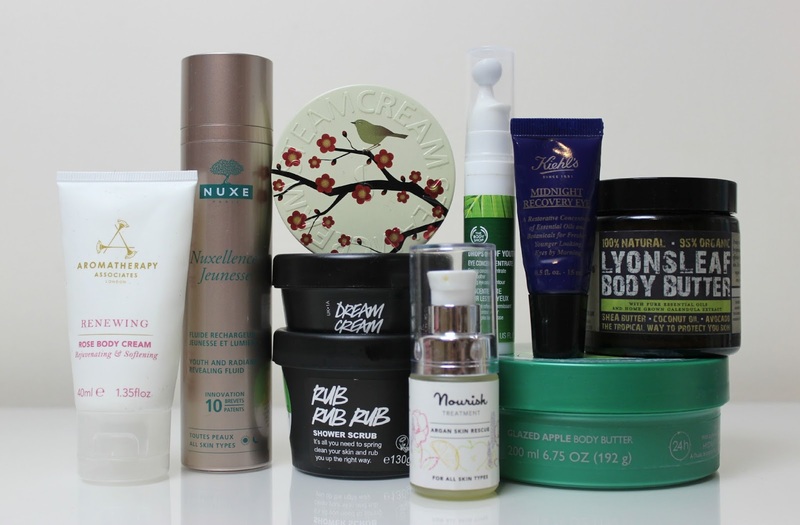 Empties posts are a great way to see what someone really thinks about a product once they've finished it all up - would I recommend these products to others, and even more importantly, would I repurchase? One of the products featured inside the limited edition Birchbox Tatler Box was a 40ml sample of Renewing Rose Body Cream from Aromatherapy Associates, a body cream that I've used before and really love. It just has a really lovely scent that lingers well throughout the day; instantly soothing and relaxing. It isn't the most hydrating of body creams, but it does leave my skin feeling soft and pampered - I love this mainly for the scent! A bit pricey for me to want to repurchase this at full size, but it's always lovely to see Aromatherapy Associates featured in beauty boxes. This serum has been a favourite of mine for a couple of years now and I've repurchased it before - so I would 100% repurchase again! It's a beautiful serum that works so well with my oily and dehydrated skin, to give my skin an instant smoothness and softer feel, working to hydrate, revive tired, dull and lacklustre skin, all whilst giving my skin a lovely plump feel. I honestly can't recommend this serum enough - it's pricey but lasts forever and is well worth the investment! Full review here. I feel like this stuff lasts forever. I had my moments with STEAMCREAM; sometimes I'd use it daily for weeks and weeks, sometimes I'd pop it away and try other products for a while. Ultimately, this is one of the best multi-purpose creams for a budget-friendly price you could ever come across. My favourite way to use it? As a neck and decolletage cream! I will definitely be repurchasing this once my current neck cream is empty, because for the price and results you really can't go wrong! Full review here. This is a product I have heard people rave about for years and years, specifically for healing and caring for tattoos. I had a little 45g sample pot to use up and decided it was time to give it a go, after letting it sit in my drawer for far too long. A cooling and soothing lotion with a lovely consistency, it actually works really well to moisturise skin and is even advertised as great for treating eczema. It has a lovely subtle scent too, which is always a winner for me - I would definitely consider picking this up in full size! Rub Rub Rub was a product I wanted to try for years and after giving the Lush Hello Gorgeous Gift Set a go, I was finally able to try this multi-tasking vibrant blue scrub. How is it multi-tasking, I hear you ask? Well, as well as a lovely body scrub which leaves skin feeling soft and smooth, it can also be used as a cleansing shampoo - providing instant volume for cleansed and happy hair. Big, big fan of this and I plan on repurchasing Rub Rub Rub in the full size very soon! Full review here. Another skincare product which seemed never ending, I was so surprised by how much I liked this soothing and hydrating eye gel from The Body Shop. It really did manage to smooth the delicate skin under my eyes, providing a firmness which is much needed when you're closer to 30 like me! I used this mainly as a morning eye cream, and would consider repurchasing it in the future (although I have to admit, it's not my absolute favourite). Full review here. Another serum I've used for many years now, I've recently finished my 2nd bottle. This one is a winter saviour for me and I use it sparingly as a treatment throughout winter, because just a couple of nights use will completely renew, revive and moisturise my skin like nothing else. It's just absolutely beautiful, and when it comes to winter skin and keeping dehydration at bay, few things compare. I will definitely be purchasing my 3rd bottle this coming winter! Full review here. Without a doubt the skincare product I have repurchased more than any other, and the one and only product I know will always be a permanent addition in my nighttime skincare routine. Nothing compares to Midnight Recovery Eye when it comes to a hydrating, firming, nourishing, skin-loving eye cream for me, and I will recommend this to the high heavens forever more! Absolutely amazing product that is completely unbeatable. Full review here. For me this was a beautiful body butter that effortlessly left my skin feeling deeply hydrated and moisturised, much softer and beautifully pampered. For many this body butter will have a 'feel' to the skin that you may not like; it does sink in well but it has a residue which throughout the day sinks in more and more and for me, it's a type of body butter I absolutely adore - but for those who prefer no residue left behind by products, it may not be your thing. Personally? I'll be repurchasing this natural beauty this winter, to keep my skin soft and smooth. Full review here. What would an empties post be without an appearance from a The Body Shop Body Butter? These are a daily must-have for me and few body care products make me feel as content as this ever-expanding range. Glazed Apple was a limited edition scent at Christmas, but like all body butters in the range it left my skin feeling super soft and lovely. I'd actually love for this to be a permanent scent in the range, as it was lovely and refreshing! I have a tin of Steam Cream and it's been abandoned the past month or two. I'll dig it out and give it a try as a neck cream on your recommendation.